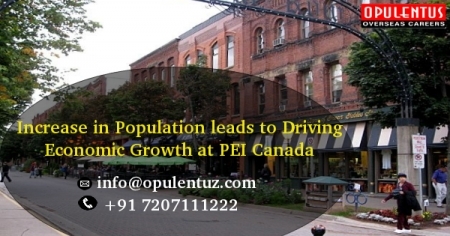 An increase in Population, caused by immigration on Prince Edward Island has been a major factor to encourage economic growth, mainly in the housing market of the province. The island has reached its goal of attracting 150,000 residents in 2017, and now has an aim of attracting 160,000 residents by 2022.With the increase in population new housing also develops and now the new projects have seen an increase of 44 percent. There is considerable improvement in manufacturing, retail sales and employment also. Statistics Canada had projected that the numbers present in 2006, would be maintained around 135,851 and then the population would decline. Presently, the province aims for a population of 175,000 for 2032, and 200,000 for 2055. Such measures will lead to growth and rejuvenation of the population of the Island. The growth is concentrated around Charlottetown, and other areas like Kings County and West Prince witness a decline in population. This anomaly is being addressed through the Island’s Provincial Nominee Program, which contains immigration streams like P.E.I Express Entry, Skilled Workers category, Critical Workers and the Ownership Stream (100%) for business immigration, aimed to boost the population, especially in rural areas. The employer-driven, Atlantic Immigration Pilot, a joint initiative of the federation and the provinces is important for boosting the population. It has the capacity to bring 4,000 immigrants per year to the four provinces of the region. It will pursue attracting and retaining immigrants in the region by going for a Settlement Plan and Endorsement by Province prior to granting permanent residence. Atlantic Immigration Pilot has The Atlantic High-Skilled and Intermediate-Skilled Programs followed by Atlantic International Graduate Program.The work experience, education, and job offer needed by a candidate are based on the status of the applicant like a worker or student graduate. Work Experience for Workers demands working for one year or 1,560 hours in the previous three years. The work can be done in one occupation and work with different employers is also counted. Volunteering or unpaid internships are not counted. There are a few other norms also. International Graduate Candidates do not need work experience. The employer does not need an LMIA and each province will correspond regarding the list of employers which will hire in the Atlantic Immigration Pilot. Score a level 4 in the CLB exam in English or the Niveaux de Compétence Linguistique Canadiens in French. They also need to take an approved language test and meet the standards outlined for speaking, reading, listening, and writing. Candidates need to show a proof of possessing sufficient money to support themselves (and their families) after the process of immigration is completed. These depend on the size and numbers in of the family. A candidate needs to have an assessment of requirements before immigrating. After this is done the candidate will receive a plan containing information regarding the community they should move to and the place where they can seek help after arriving. Employers are diligently required to complete an Application for Endorsement for each candidate who will fill an existing vacancy.Candidates are not in a position to apply to IRCC without attaching an endorsement, which contains the required details of settlement plan and job-offer.